Indian home remedies for tackling morning sickness. Morning sickness is also called Nausea which is a feeling that you might throw up. It happens during the first few months of pregnancy and is quite normal when it happens during that time. There are certain changes in the body happening everyday which may cause morning sickness, but it is not necessarily be accompanied by vomiting. In most cases, nausea gets relieved in the second trimester. When you have feeling to throw up then you must avoid spicy and strongly flavoured or seasoned foods as they might trigger nausea. Yoga and meditation may help to relax yourself. It will be easy for you to cope up with discomfort when you are relaxed. Check out our recipes of refreshing beverages to soothe your morning sickness. Ginger Melon Juice will make your mood just right. Besides having the goodness of watermelon, this vitality juice also contains the miraculous power of the antioxidant 'gingerol', a substance present in ginger that dilates blood vessels and improves blood circulation. Spinach and Mint Juice is a cool and healthy drink to start your day with when you have nausea. The digestive oils in mint will soothe your stomach and refresh your mind. When you don’t feel like cooking then you can just mix and blend ingredients to make Apple and Oats Milkshake which will calm you and make you feel full. Both apple and oats are fibre rich ingredients and fibre has many health benefits. Apple Cucumber Juice is a fibre-rich and invigorating juice that helps to detoxify the body and keep your skin glowing all day. Small bites of dry snacks to feel good when feeling nauseated. Beetroot Shakkarpara is a healthier version of traditional one. This is baked unlike traditional recipe that is deep fried. Beetroots are a unique source of phytonutrients called betalains, which have many health benefits. Oats and Walnut Chikki is an excellent quite bite option when feeling nauseated. It is a good source of iron. Oats give fibre and walnuts offer a good deal of omega-3 fats. Whole Wheat and Methi Khakhra are extremely healthy with fibre-rich wheat and iron-rich methi, these aromatic khakhras are a must try. Being free from excess seasonings this will not cause or trigger nausea. 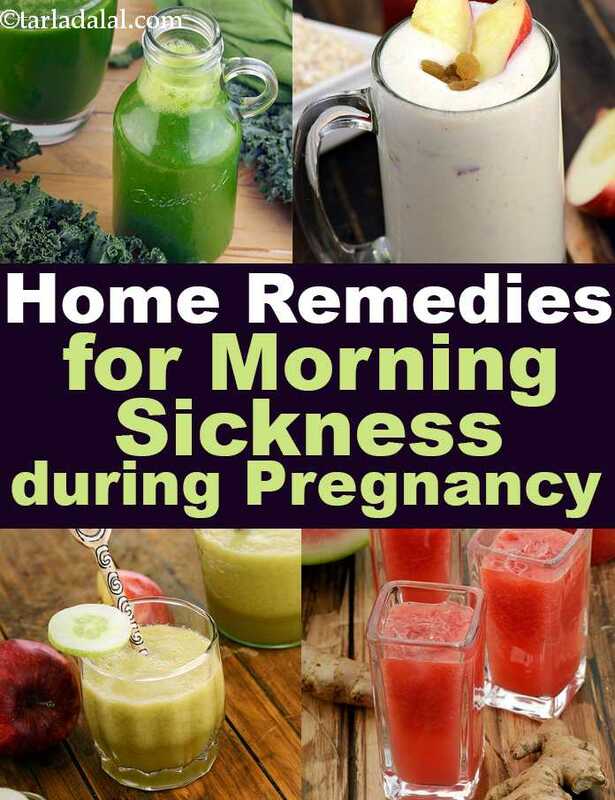 Enjoy all our home remedies for morning sickness recipes for pregnancy. Explore more varieties in our pregnancy section everyday.